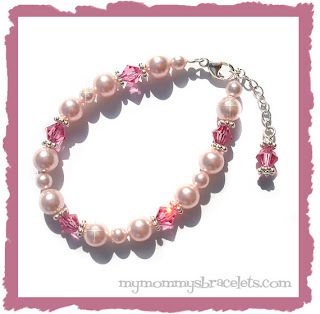 It's MY birthday...well, not "MINE", but mymommysbracelets.com! I can't believe it! It was 4 years ago that I started my business. I first started by selling to friends/family and then on eBay. I didn't seem to be getting anywhere so I took a big risk and opened an online boutique with yahoo and designed it myself using one of the free templates they offer and a logo that I had designed. My son G named the business because he would say to people wearing my jewelry "hey...is that one of MY MOMMYS BRACELETS?". I worked really hard getting it just the way I wanted and got my website to rank pretty high in the search engines. Then I met Surjet from Tea's Treasures. She pointed me in the right direction by giving me valuable information about WAHMshoppes *my hosting provider* and about buying a custom template to change the look of my website. I took her advice, joined WAHMshoppes, and found Melanie at Auction Add-Ons that had the PERFECT template for my website. Then the work began all over again...listing products, designing new ones, trying to teach myself how to use the store and how to get to the top of google and other search engines. Once my business started to grow I decided that I needed to improve it even more. So, I had my pictures optimized by Kirsten at Online Image Solutions. Now business is better than ever and can only get bigger and better! I am currently making more improvements to my website *thanks to Melissa at Where To Start Websites* and hope that you enjoy some of the changes. My business is what it is today because of many people...and because of you, my loyal customers. It's almost time for the kids to go back to school...YAY, just kidding...sorta. Anyway...I have hooked y'all up once again with some fabulous items from some of my favorite Mommy and Baby boutiques. There is everything from jewelry *from yours truly*, to backpacks, lunchboxes, bows, notepads, labels, and so much more! So hurry up and enter and pass it along to everyone you know...and don't know. To enter visit the BACK TO SCHOOL GIVEAWAY, fill out the form and keep your fingers crossed. Winners will be announced August 11th via email and also on the website. Too cute huh? This is a necklace that I designed for a friend. 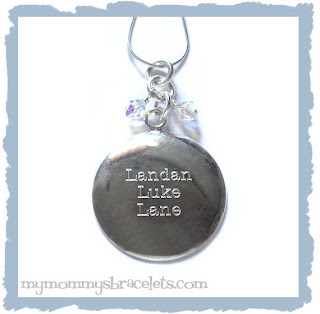 It's sort of a spin off of handstamped jewelry, but with the classic look of engraving. 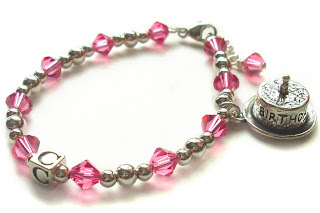 It can be personalized with birthstone crystals and it holds up to 5 names. A perfect gifts for Mothers, Grandmothers, or even Aunts! Since my oldest G finished kindergarten with perfect behavior and wonderful progress/test scores we promised him a vacation. Since he loves to learn about everything and anything we thought the ultimate vacation close to home would be Houston, Texas, home of the Johnson Space Center *NASA*. He had a blast! He learned alot and was just simply fascinated with the moon rover...of course. Little L, my 2 1/2 year old was just along for the ride...there really wasn't much for him to do but look good. Then we decided to hop on over to Kemah, a small town outside of Houston that has a "boardwalk". Both the boys had a blast! They had some carnival type rides and a train that we rode. Not to mention G got to feed the stingrays outside of the Aquarium restaurant that totally distracted both boys during lunch. After that we drove about 30 miles to Galveston so that the boys could see the beach. We didn't get there until later in the afternoon and after finding a hotel and ate dinner we were all pooped. We went to bed and hit the beach in the morning. The boys had a great time finding shells and G even found a crab still in the shell! Then it was the dreaded 4 1/2 hour drive home....not too bad actually. L slept most of the way and G watched movies and played his leapster. I was so glad to be home....it was a great vacation though. I have been busy creating new items for my websites and this one I absolutely love that I wanted to share. I made this for my niece Georgia for her birthday. She loves jewerly and this has just about every girlie color she loves. So, it's now a product on my website ready for you to purchase too! Remember...I am always open for suggestions...alot of my products have been customer requests. Also...exciting news!!!!!! Another giveaway is coming soon! This giveaway has a "Back To School" theme and there are some great items for not only school age kids and teens, but also for Mommies that have school aged children. I will keep you posted on the progress......you won't want to miss this! So...I thought I would share with you a "typical" day around here...just so you can get to know me. I had a great agenda planned...work on my website all day in between every day Mommy life, send out a HUGE sale newsletter, place my bead order and work on my website again while the little "angel" slept. Well...as you can see from this picture he was obviously NOT taking a nap when I thought he was. What is that all over him you ask? Powder? NOPE! Lotion? NOPE! Flour? NOPE! It's diaper rash cream...and I mean the greasy kind, whole jar GONE. YEP...not a joy I tell ya. Of course as any Mommy would I had to snap a few pictures to capture this "kodak moment". I threw him in the bath and scrubbed, scrubbed, and scrubbed....what did I end up with? One soft, greasy headed 2 year old that thinks it's hilarious! AND...notice the broken wood blind in the background? Yep...another day, another story. But, here is a favorite of mine. I soooooooo need a baby girl, she would be rotten I tell you! 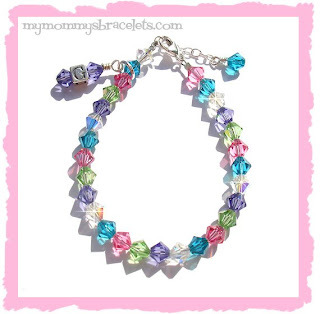 This bracelet is so girly and I just love the way it turned out. Of course it's named POSH PRINCESS, because every little girl needs something this precious. Pearls, crystal, silver...what is there not to love? There are more though, lots of girls jewelry, some Mommy jewelry including engraved jewerly that you will absolutely LOVE!